When to buy a Macbook, iPad or iPhone? Should I upgrade my Mac now or should I wait for a new model? –I get this question a lot. There should be a medical term to explain that feeling of impotence you get when you buy an Apple product the week before the release of an upgrade. 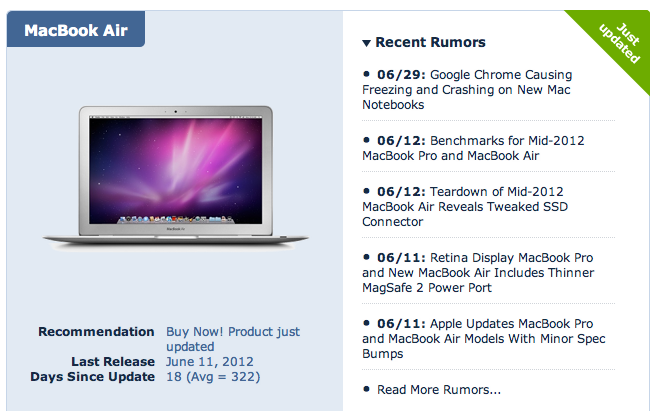 To spare us the pain, the people from Macrumors have created a website where they track all of Apple’s products and give advice on whether to buy them now or not. So next time you’re thinking of upgrading your iPhone, iPad or Mac, check out this page before making a decision.